Skyharbor struggle with perceptions as they release a dense but conflicting record in Sunshine Dust. The loss or sudden change of a notable member can be all but a death sentence for a band. Many acts, even prolific groups with storied careers, have fallen prey to the cries of older fans, struggling to manage their change sonically, whether intentional or not. This is all the more true when the topic of change turns to the vocalist. While by no means are the vocals the be-all-end-all of a band’s identity, it is at the forefront of the soundscape and often a defining factor for many fans to latch onto. 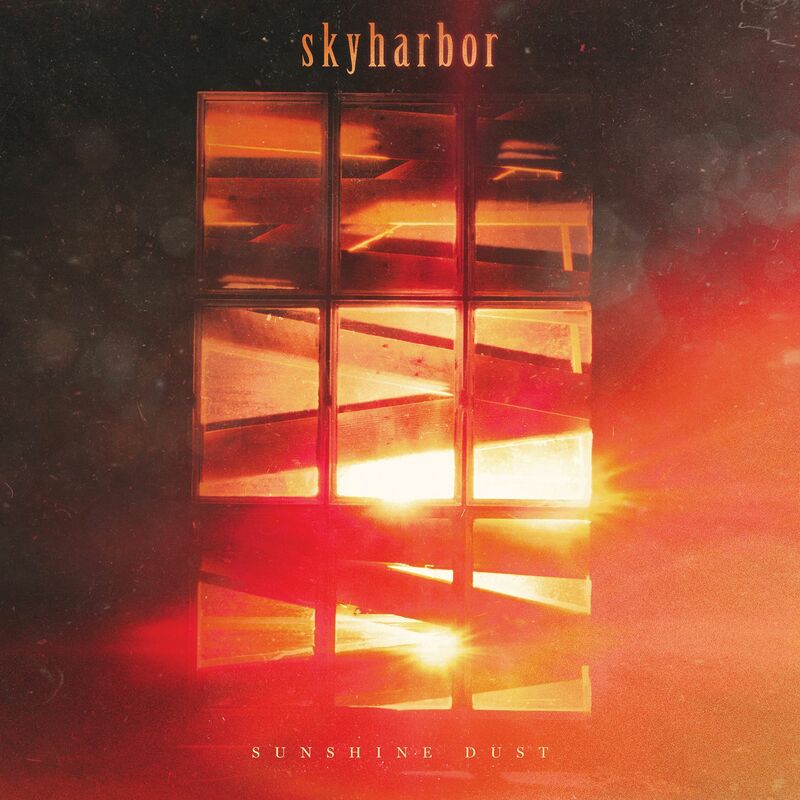 This puts Skyharbor’s first release since 2014, Sunshine Dust, in a perilous place. The change in style has been a slow calculated burn that has been demonstrated and expected with several teases and singles released, but the change from Daniel Tompkins to Eric Emery is a not insignificant shift that will undoubtedly ruffle a few feathers while opening the group to a different demographic in the process. We were introduced to the newest Skyharbor frontman, Eric Emery, as early as June 2015, when he posted a cover of Guiding Lights’ “Evolution” openly stating his new position – as well as introducing his monster fluffball of a cat, Apollo. It only took two months before we were treated to some new material in “Out Of Time“, a shorter, more hook focused tune that solidified the idea that this change would bring a shift in overall tone in the record to come. This was followed up with the emotional “Blind Side” and “Chemical Hands” (the latter of which was renamed and improved upon on the album under the name “Synthetic Hands”). More recently they dropped “Dim” and “Dissent” in the lead up to the full release in September. If you’ve been keeping track, that’s a total of five songs (four if you don’t count “Chemical/Synthetic Hands”), and this brings a unique problem to the table: while this helped smooth the transition of vocalists by clearly laying out expectations, it also led to the band playing many of its cards up front, tempering excitement and causing an uneven initial listen. With five of thirteen songs being known quantities (twelve if you discount the ambient opening “Signal”), and a large portion of those being relegated to the front end of the album, it creates an awkward temperance to enjoyment as you either dampen your excitement by re-listening to twenty minutes of known material or skip to track six. There is no easy solution to encourage fans to be excited over a four year lead up period while setting clear expectations for the shift in sound. However, I can’t help but feel that the record would have benefited greatly if the two most recent singles were the only two to have come out pre-release. I don’t want to dote on the elephant in the room here. Yes, it is surprising how much of Skyharbor‘s sonic identity was entwined with the vocal stylings of Daniel Tompkins, and yes, there is a clear change to a more commercial direction. These changes, however, feel entirely intentional. While I personally prefer the older, more progressive tracks of Blinding White Noise to the chorus-heavy streamlined structures of Sunshine Dust, this was not a rushed release, and you can tell there was care put into how each track flowed from one another (the segue from outro of “Synthetic Hand” into “Blind Side’ in particular was a treat), and, at an hour long, there is a large volume of content here. Talking solely of the music, there are some quality vocal hooks throughout the album. You can feel the energy when Emery slides into the high notes of “Out Of Time” or “Synthetic Hands”, and the melody of the title track’s main reprisal is surprisingly nice. There are also plenty of small moments that elevate the experience, such as the strong conclusion to “Synthetic Hands”, the surprise instrumental “The Reckoning”, and the sporadic moments of vocal fry growls and aggression. Even with less of a focus on crafting tonal soundscapes and impressive musicianship, there is still a level of confidence in the musicians’ abilities in their performances, and this approach has let the impressive abilities of the new frontman come to life. Tompkins is a tough act to follow up, and Emery delivers with a unique sound and some truly impressive notes. While I’d like to say that the new direction, despite being not up my personal alley, is soundproof, there are a number of areas in which the album still manages to fall short. This is most notably seen in the lyrics. At the risk of sounding harsh, the writing of the album often falls into very cliche and borderline ‘edgy’ territory. Not all tracks fall under this, but most unfortunately do. It’s also a shame to say that the strongest tracks are likely the ones already released. “Ethos”, Menace”, and “Ugly Heart” are notable low points, with the latter having an angsty pop-laiden chorus that was hard to get through at times. The most disappointing part of it all is that most tracks seem to fall into forgettable territory, not being particularly great or awful, existing in mediocrity. Being so close to the album’s release and having followed the band through this transition period undoubtedly puts my perspective into a strong bias. Taking an objective outside look at the record shows a handful of really strong moments, some lackluster writing in lyrics and structures, and a host of songs that many will sit and enjoy casually. This is not a case of the songs needing more time to gestate, it’s simply a lack of that spark that makes music something more than a few elated minutes of your time. I hold hope for the future of the band, and I think Emery is a strong vocalist, but only time will tell how Skyharbor‘s music will continue once Sunshine Dust is released and the dust settles among the fanbase.